Eric and Aaron in the Grafton News, May 7, 2014. 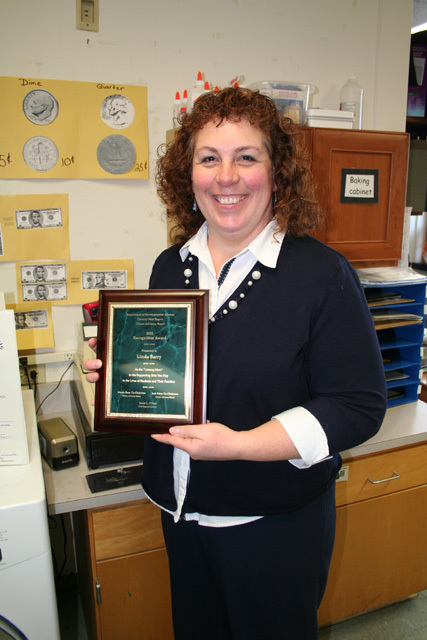 On Friday, March 4, Linda Barry, special education teacher at Grafton High School, received the 2011 Unsung Hero award presented by the Central Massachusetts Department of Developmental Disabilities Citizen’s Advisory Board. 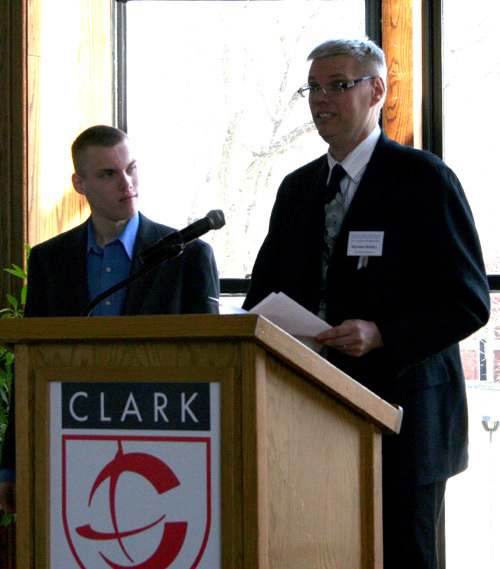 The award was presented at the Annual Citizen Advisory Board’s Legislative Breakfast held at Clark University in Worcester. Mrs. Barry was nominated for the award by Grafton residents Richard and Cynthia Bissell who’s son Eric is a Junior at Grafton High. The award was presented to Mrs. Barry by nominator and Keynote Speaker Richard Bissell. Mrs. Barry also received a citation from the Massachusetts State Senate presented by Jason Palitsch, representing Senator Mike Moore. 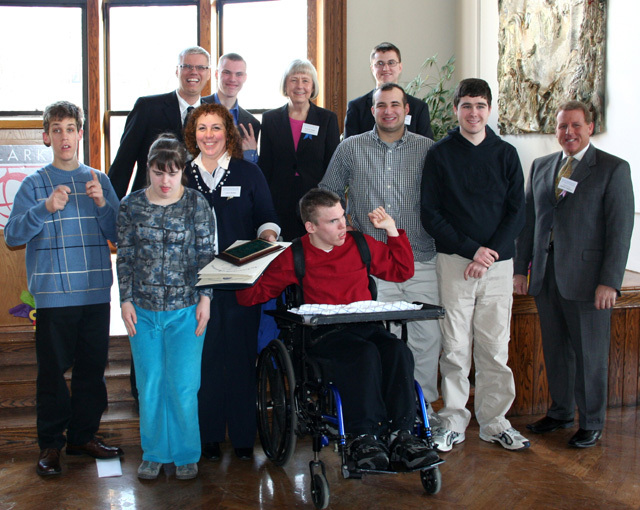 The DDS Central Region Citizen Advisory Board holds an annual Legislative Breakfast in order to bring legislators, provider agencies, DDS staff, individuals and families together to discuss issues facing people with developmental disabilities. It has been a tough couple of years for DDS due to the current economic problems and statewide budget cuts. Department of Developmental Disabilities Commissioner Elin M. Howe spoke of the challenges faced by the department in order to provide much needed services for children and adults with intellectual disabilities in the face of budget cuts and staff lay-offs. “Of most concern to all of us, barring none, are the cuts to our family support services account.” said Howe. In his Keynote speech, Richard Bissell discussed the importance of family support funding. “We are talking about a very small amount of money, compared to the cost of residential placement.” “Families are saving taxpayers millions of dollars by caring for their children and adult children at home.” A small amount of family support money can be the difference between a family surviving or not. The theme of this year’s Legislative Breakfast was “Where Are We Going?”, with a large question mark. Will the funding be there in order for people with developmental disabilities to live with dignity as productive citizens in our communities or will we return to the dark ages of neglect? It has been said that a community, a state, a country and in fact the world should be judged by how well we support our most vulnerable citizens. These days, we are over-saturated with news 24/7. Sometimes it’s hard to distinguish facts from hype. There has been plenty in the news about H1N1 (Swine Flu), but I honestly didn’t pay much attention to it. Remember all the hype surrounding the Bird Flu? Then all of a sudden, some sort of flu-like virus started spreading like crazy at Grafton High School where the twins go to school. Every day last week, more and more kids and teachers were out sick. My boys were out Wednesday with upset stomachs, which I think had more to do with my cooking than any type of flu. By Thursday, 236 students (about 36 percent of the total student body) were out sick. Friday, 46 percent of students and 43 percent of the faculty were sick. Since the regular seasonal flu was nowhere in the area, it seemed pretty clear that it was the Swine Flu spreading throughout the high school. The school had to be closed early at 11am on Friday and will remain closed until at least next Wednesday. During these four days, the school will be thoroughly cleaned and the students were told to not mingle with other students in order to try to halt the spread of this virus. On Friday, two students tested positive for H1N1 flu, which means that this is the most likly cause of all the absenteeism. Grafton High School is the only (or at least the first) school in the entire state that was forced to close because of the Swine Flu. What are the odds that we would be right smack in the middle of this epidemic? So far all three of my boys are fine. Oh and this was all going on while President Obama was visiting Massachusetts. He got back to Washington and declared a national emergency! The Grafton Public Schools accepted the very generous donation of a handicap accessible van at a dedication ceremony Wednesday morning in the Grafton High School parking lot. The van was donated by the Koomey Family in memory of longtime Grafton resident Dr. John G. Koomey. The vehicle will become a part of the Functional Academic School-to-Work Program at Grafton High School. 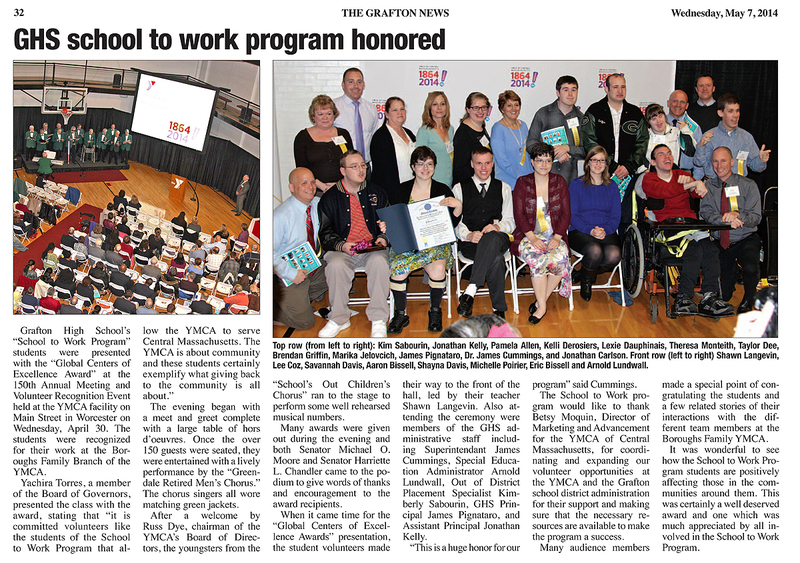 The program assists students with functional academics, life-skills, and vocational skills needed to become independent adults within the Grafton Community. “We tailor each program to the individual child,” Mrs. Barry, Grafton High School Special Education teacher said. In the past, the students access had been limited to establishments that were within walking distance of the school. Superintendent Dr. Joseph Connors and School Committee members Daryl Rynning and Peter Carlson were on hand to accept the donation along with Special Education Director Kathleen Baris. A special plaque, signed by the students in Mrs. Barry’s class, was presented to the Koomey family. Dr. Koomey was fondly known as “Poppy” by his grandchildren, two of whom are special need students in the Grafton public schools. The words “In Memory of Poppy” are inscribed on the back of the van.